This 3 bedroom 2 bath home is located the gated community of Colington Harbour on an extra large homesite nestled among a canopy of trees for extra privacy. 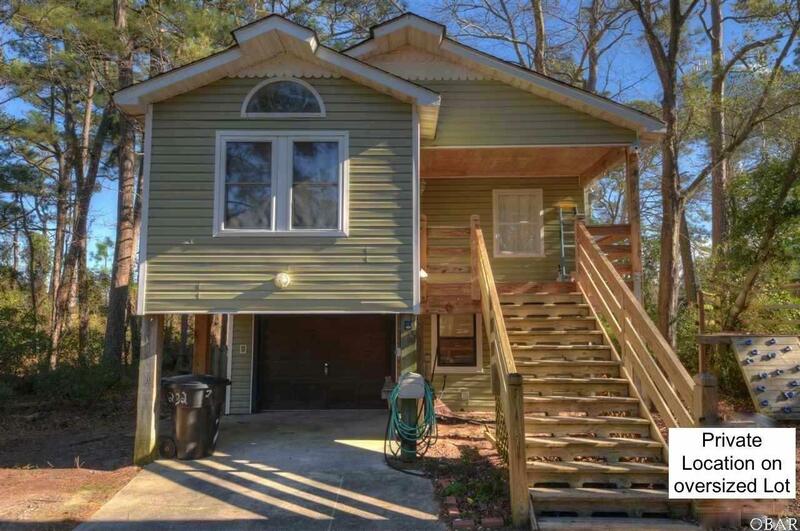 Enjoy an attached one car garage with unfinished workshop area, hardwood floors in all bedrooms, 1 master suite, vinyl siding, new laminate flooring in the kitchen and dining area, stainless steel appliances, and large front and backyard. Layout is open with lots of natural light. Extra quiet location perched within 2 cul de sacs. Perfect for young children or dogs. Hardwood floors are only 2 years old, stainless steel range/oven, and microwave a year old. BRAND NEW washer! Colington Harbour offers a boat ramp, club house, beautiful soundfront beach and playground, tennis and basketball courts with low annual fee. Optional pool membership. Sunsets from this community are spectacular!! The washer and dryer used to be upstairs, but have been moved downstairs. The sellers will hook up before closing at the desired location of buyer (upstairs or in ground level where they are located now).